Rotherham-based Metalysis has announced a new research and development project with Kazakhstan to develop high value metals and alloys for additive manufacturing. The Manvers company holds the worldwide exploitation rights to a process which sees specialist powder metals created in a simple, cost effective process with significant environmental benefits. Backed by investors and grants, the Cambridge University spin out secured £20m of investment last year and recently opened a new Materials Discovery Centre on the Advanced Manufacturing Park (AMP). Metalysis carries out bespoke, commercial R&D projects to produce exotic metal powders for high performance alloys in the aerospace and automotive industries. The latest project will support developing Kazakhstan's metal additive manufacturing industry, basing in-country efforts within the Central Asian country's Park of Innovative Technologies – a science and technology complex aimed at diversifying national, economic and industrial development. 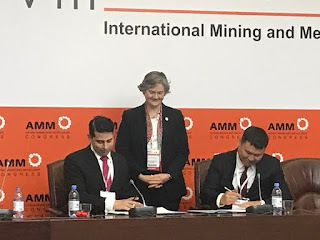 The Autonomous Cluster Fund of Kazakhstan and Metalysis signed a metal additive manufacturing partnership at the Astana Mining and Metallurgy conference this week with company representatives and UK and Kazakh Government officials attended the signing ceremony. Metalysis is in the process of commercialising the technology which produces metal powder directly from oxide using electrolysis and has the potential to significantly increase production volumes. It is being used to produce titanium, tantalum, and related high value alloys that are used increasingly by major worldwide industries such as aerospace, marine, medical, chemical, automotive and electronics. The partners in the latest collaboration will use Metalysis' disruptive technology to develop metals and bespoke alloy powders suitable for additive manufacturing. Kazakhstan is embarking on a strategy to further diversify its economy from raw materials into other value-added industries. Initially, an R&D programme will be conducted at Metalysis' new Materials Discovery Centre and subject to its findings, the Partners will then seek to develop Kazakhstan's metal additive manufacturing industry, basing their efforts within the Autonomous Cluster Fund's Park of Innovative Technologies - the country's "Silicon Valley" - weighing opportunities for in-country production of metal alloy powders and printing commercial products using additive manufacturing techniques. As the ninth-largest country in the world by area, Kazakhstan's mining industry is huge and it produced the fourth most titanium in the world at 27,000 metric tons in 2013. Iluka Resources, the Australian mineral sands mining firm that has invested millions and taken a 28.8% stake in Metalysis, has an ongoing exploration drilling program in the former Soviet Union country. Dr. Malek Deifallah, director of business development at Metalysis, said: "This is an exciting time for Metalysis. We are very pleased to partner with the Autonomous Cluster Fund, and together pursue the clear opportunities Kazakhstan presents for metal alloy powder production and additive manufacturing. We look forward to providing future updates as we go about applying our unique know how and technology." Sanzhar Kettebekov, CEO of Autonomous Cluster Fund (Almaty Tech Garden), added: "For the purposes of adhering to the priorities outlined in the President's Address, we are working to grow new industries with the use of digital technologies. Our cooperation with Metalysis is aimed to develop Kazakhstan's industry sector in the field of metal additives production. "We are delighted to have established such a partnership, which will contribute to the diversification of the economy of Kazakhstan." Last week, Metalysis announced a new R&D programme focusing on a high value aluminium-scandium alloy that is being carried out with an international partner.